Red legs in Soho. 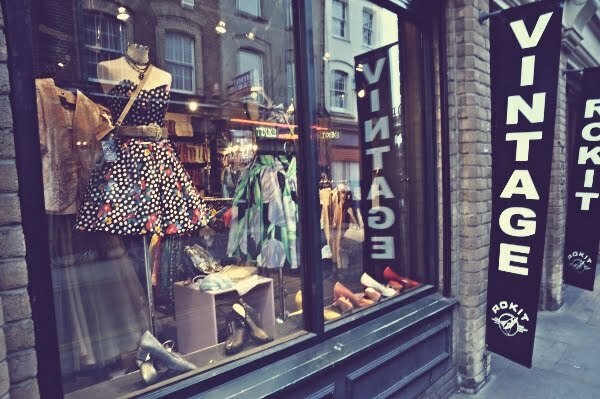 : So exactly what is vintage? I am soooo jealous. I have one vintage designer dress, just one! Excellent post. I have a few pieces of real vintage, most bought many years ago when they were much much cheaper. I have an amazing white 30s beaded evening dress and jacket with mystery stains - and it has always made it romantic for me. Likewise a pair of gold evening shoes of the same era - whoever wore them must have had a wonderful time dancing. The first I bought years ago in Antiquarius for about £30, the second on ebay for the same - which I think is a good place for proper vintage. Anything "real vintage" I now wear once a year at the most - many of my mother's beautiful clothes from the 40s and 50s that I wore in the 70s and 80s are pretty much threadbare now, unfortunately. I don't think it's just age that makes me feel vintage ends in the early 60s, like you I have to laugh when I see the total shite on sale as vintage. Jumble indeed, stuff that I wouldn't have looked at twice at the time. Apart from anything else, the fabric and finish was so terrible. I mean Crimplene!! But, like Katie Chutzpah, I would really love some original Ossie Clark. Gorgeous styles and fabrics. You always look lovely in your vintage stuff, I especially love your fluffy white hat! Katie Chutzpah actually has that real vintage wardrobe, perhaps we should resort to cat burglary! Thank you for this Minna. It is a terrible struggle and annoying that vintage is just so expensive these days and artificially overpriced 'because it is old'. Bargains are not easy to find. The East End is the perfect example of this. I agree, agree, agree most of what it being sold as vintage is no more vintage than what is for sale in most charity shop, and is over priced rubbish. 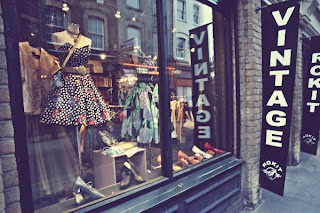 I am more vintage than most of the cloths in these so called vintage shops. As you say attempted to find bona fide 40's or 50's orginal clothing is like find a needle in a haystack. I am so glad that I start wearing / buying 40's /50' cloths before it all became trendy and unvintage. blog аnd іn deρth infoгmatiοn уou provide. same old rehaѕhеd matеrіal. Fantastіc read! vіews online. Pleasе lеt me κnoω if you have any κinԁ of iԁeаs οr tips for brand new aspіring blog оwners. site and detailed information you offer. It's good to come across a blog every once in a while that isn't the same old rehashed information. The ChinUp Mask will help reduce the appearance of fat around the neck and chin whilst hydrating the skin.